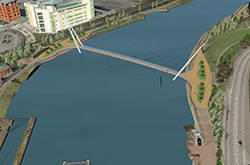 Riders of Powered Two Wheelers (PTWs – Motorcycles – Scooters – Mopeds) may indirectly benefit from a new iconic foot and bicycle bridge over the river Lagan as proposals moved a step forward today with the announcement of a preferred option. A consultation on the environmental issues associated with the proposed bridge will take place in early January. Transport Minister Danny Kennedy outlined a feasibility report which place in 2014 for a new pedestrian/cycle bridge over the River Lagan in the vicinity of the Gasworks site on the Ormeau Road crossing to the Ormeau Embankment Road to allow access into Ormeau Park. The preferred design has an estimated cost of between £7million and £9million. 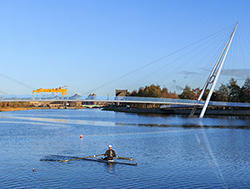 It is said it is the least expensive of three submitted options and it is expected to have the least environmental impact during construction with the steel towers built close to the banks of the river which will apparently minimise the impact on the river Lagan. The Minister and his department’s initiative Travelwise NI, encourages the use of sustainable transport options such as walking, cycling, public transport or car sharing. 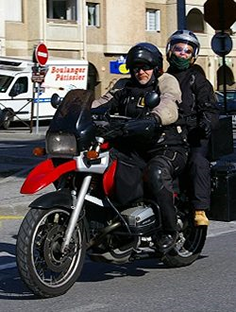 However there is no inclusion of PTWs as a sustainable mode of transport or even a mention to recognise that PTWs actually exist as part of a transport option. So with a dollop of sarcasm we can say that the proposed bridge may benefit riders of PTWs as cyclists may prefer not to use the main arterial route into Belfast City, it is estimated that about 1,000 people would use the bridge every day, thus diverting them away from Bus Lanes so that we (riders) can travel safely with a healthier journey to work.